It’s a bit of a long story but I will condense as best I can. I never drank beer. Started about two years ago when we found a pub near our house that served an interesting selection of craft beers (how can you not want to try a chocolate peanut butter beer named Sweet Baby Jesus?). They had Angry Orchard on tap and for beer sissies like me, hard cider was an exciting way to experience ordering a draft. And then the bartender recommended mixing it half-and-half with Yuengling. And then I was soon drinking Yuengling. Like a real grown up. 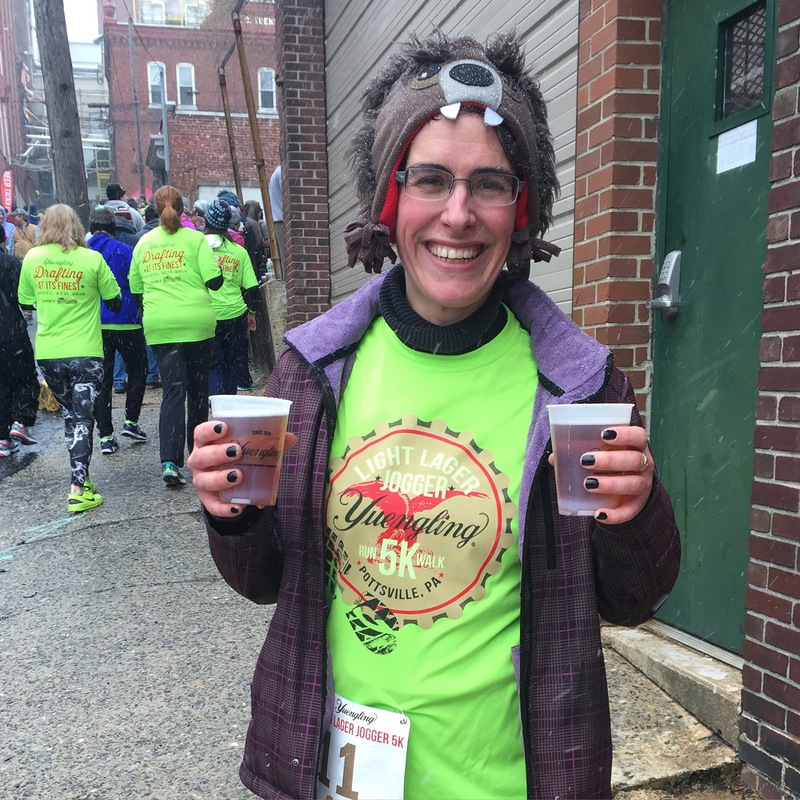 My friend Gayle mentioned that Yuengling has a 5K walk/run. So we did it. Last year. The third annual event. I finished in right around 50 minutes and if you’ve ever seen Pottsville and the race course, the first mile from the brewery is up hill. The second mile is flat for a while and then up hill. The third mile is down hill. The beer tent is at the bottom of the hill. I entered a significant decade on my birthday last year, and I have been working really hard to gain more muscle, strengthen my lower body and attain more general endurance and fitness. Then I broke my ankle. So, when I registered my daughter and I in the 4th Annual Lager Jogger my goal was to run it. Now I have cerebral palsy and I broke my ankle… But I thought this was doable. It was a rough winter. A non-existent Spring. An incredibly stressful Christmas season at work, where I put in practically full-time hours. Equally stressful at home with a pre-teen daughter who is so close to puberty none of us may survive 2016. I started grad school. My cat of 17 years will be put to sleep on Monday. Training did not happen. Not in earnest. My daughter flat out refused. And then child got a cold. And all my commitments made me a little crazy. And then the weather forecast said it would be 30 degrees and snowing. But I needed to win something this week, even if it was hope of someday running a 5K. So I started to run up that hill. My cold toes hurt as the hit the ground and both ankles protested. I probably only made it a third of a mile but then I walked hard and fast. One resident was passing out orange juice. Others had Yuengling on tap from kegs in their front yard, handing out beer to runners as they went by. Once we reached the top, I resumed running again and the pace kept me warm as the snow increased. I ran until my lungs couldn’t function in the cold air, walked to rest, and then ran again. I’m still no runner but I’m damn proud.